Welcome to the home of WOOF&BREW, The Pet Drink Specialists, and home to some of the most unique, healthy tonics and treats for loved pets in the market. Our treats include 'Pawsecco' still wine for dogs and cats, and 'Bottom Sniffer' beer for dogs, as well as 'Pawsecco Freeze Pops' - winner of Best Treat 2018. Our tonics offer healthy, herbal support for anxiety, senior dogs, skin & coat - and even our latest product, Windy Hound, for doggy trumps! It was pondering the balance between passions and professions that led to the launch of WOOF&BREW and the world's first herbal doggy tea bag. The co-founders, Steve Bennett and Lisa Morton, brought their expertise and passion for dogs together to bring this exciting new product to the market in November 2012. More than 5 years on, WOOF&BREW products still have tongues - and tails - wagging. From the very beginning WOOF&BREW have worked with industry pet health experts, such as well-known veterinary surgeon Richard Allport (BVetMed, VetMFHom, MRCVS), to create what is now a highly recognised and successful product range. It's a range we're very proud of and we love working with like-minded, loving dog owners. Of course we've made some amazing four-legged friends along the way too. Let's start with where it all began. The worlds' first herbal doggy tea bag. 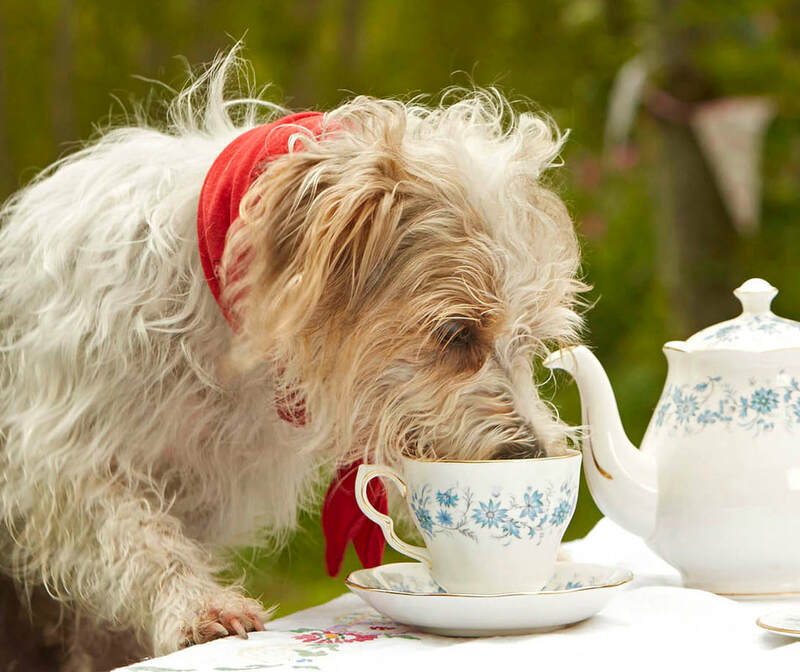 The huge benefits of herbal teas have long been recognised for humans & the same now also applies to dogs. Our nutritionally balanced, specialised blends are now available in both a doggy teabag and a ready-made tonic format. The herbal teas & tonics product range has been designed as a complementary pet food, created & blended to support your dog's specific needs. The blends are all veterinary approved as safe & the herbs used are left intact, rather than ground, to provide optimum nutritional benefits. Bursting with antioxidants, vitamins and minerals. Don't just take our word for just how good they are - check out our customer testimonials here. Keep an eye out for new products launching soon! Then there is our treat range - a range that has seen an overwhelmingly positive response. We all like to put our feet up and relax with a nice tipple - and why should our dogs not be part of that?! That's why we launched 'Pawsecco', our still 'wine' for dogs (and cats too! ), and 'Bottom Sniffer' beer for dogs. As with all our products, these both contain lots of healthy herbal ingredients, as well as offering dogs a unique and super-indulgent treat. You can see more about these by clicking here.